Today in Barbie News You May Have Missed: Fresh from what we&apos;re going to assume was a successful trip to Mars, it&apos;s only normal that a stylish career gal like Barbie would want to shed her spacesuit (even a white-and-pink satin spacesuit) for something a little more fashion-forward. Enter: the Coach Barbie. 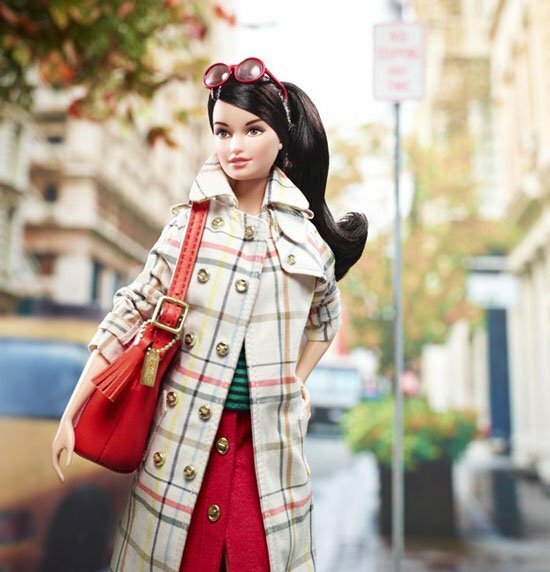 Yep, there&apos;s now a $95 "Coach" Barbie set, which includes a doll-sized Tattersall trench coat, ultrasuede skirt, colour-blocked, stack-heeled Tristen sandals, Coach Legacy round Patty sunglasses and, of course, a genuine red leather Coach Duffle purse. (The air of fashionista superiority is included, free of charge.) Just one more example -- along with the Dream House and the Corvette -- that proves your kid&apos;s plastic BFF is probably better-dressed and more successful than you are. (This isn&apos;t the first time we&apos;ve coveted a pair of Barbie&apos;s shoes.) Sigh. Seriously, though. Given the fact that the Coach Barbie, with her pint-sized purse, is currently sold out, we&apos;ve gotta wonder just who is buying this? Fervent Barbie collectors? The same mums who are buying designer bikinis for their daughters? Or just those of us who think that $95 is a great price for a Coach bag of any size? Alas, for the time being we’ll have to settle for one of Barbie&apos;s other 10,000 outfits or bags.